Matteo Renzi (Italian pronunciation: [matˈtɛo ˈrɛntsi]; born 11 January 1975) is an Italian politician. 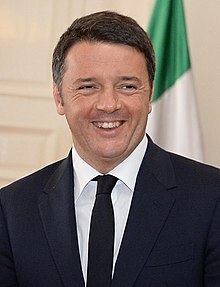 He is the 56th and current Prime Minister of Italy. He became Prime Minister on 22 February 2014. Before, he was the President of Florence Province from 2004 to 2009 and the Mayor of Florence from 2009 to 2014. He resigned on 5 December 2016. ↑ "Elezioni Comunali Turno di ballottaggio 21–22 giugno 2009" (in Italian). Comune di Firenze. 2009. Retrieved 22 February 2014. ↑ Roe, Alex. "Matteo Renzi takes Florence". Retrieved 25 June 2009. ↑ "Italy to swear in new Prime Minister Matteo Renzi". BBC News. 22 February 2014. Retrieved 22 February 2014. This page was last changed on 20 June 2018, at 03:41.